If you’ve purchased a home in the past, you know how much of a whirlwind the whole experience can be. The truth of the matter is that there are quite a few things that will need to be done before you can close on your home and you can finally breathe a sigh of relief once you get the keys to your new place. If you are just gearing up to purchase your home, you’ll know exactly what we’re talking about before long. The good news is that having a good realtor and dedicated mortgage brokers at your side will make the entire process that much easier for you. In today’s blog, we’ll take a look at a few of the ways that that is true. Keep reading to learn more! We’ve mentioned this before, but one of the absolute best things you can do when starting your home search is to speak with a mortgage consultant at Scout Mortgage before you get too far into the process. We can pre approve you for a loan amount that works best for you. We will calculate your debt-to-income ratio from the beginning and provide you with all of the info you need to start searching for a home that’s within your budget. When you find the one that’s right for you, you can put in an offer knowing that you have already been pre approved, ensuring that you don’t miss out on the perfect opportunity. Have a question about closing costs? Down payment amount? Mortgage insurance? Chances are that we can provide you with all of the financial info you’ll need at any given point in time. We take great pride in being able to provide our clients with the comprehensive help that they need from the time they start looking for a home until the time that they have their new keys in hand. 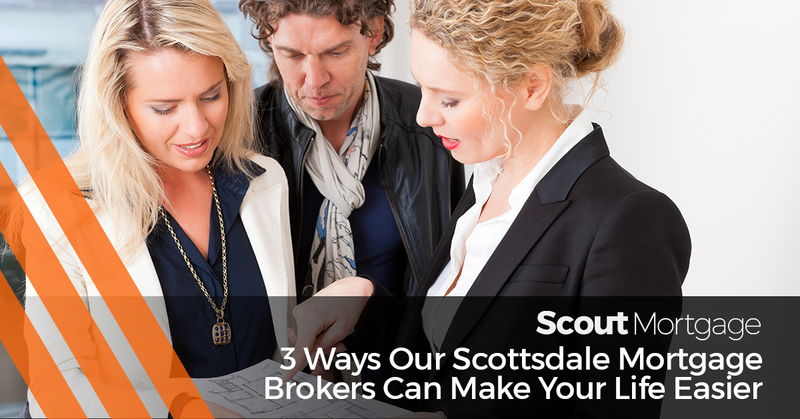 At Scout Mortgage, we strive to be the Scottsdale mortgage brokers who ensure that you have a positive experience from the very beginning. One of the ways we do this is by helping to eliminate unrealistic expectations and any last-minute surprises. In other words, we can answer each and every one of your questions, provide advice about the best option for your situation, and keep your closing costs to a minimum in the process. It really is as simple as that. Whether you’re purchasing a new home for the first time or refinancing in order to get a better rate, you can count on the mortgage specialists at Scout Mortgage. Honesty, integrity, and professionalism are our top priorities. Put us to the test and see for yourself the quality of service you’ll experience with the team at Scout Mortgage! Contact us today to get the lowest costs and rates available. We look forward to hearing from you!